This artist’s impression shows the alien planet HD 85512b orbiting the Sun-like star HD 85512 in the southern constellation of Vela (The Sail). It orbits a star 35 light-years from Earth and weighs the equivalent of 3.6 Earth masses and may be in the habitable zone. For anyone keeping track, the number of confirmed alien planets now stands at more than 600, bolstered by the announcement today (Sept. 12) of 50 newfound alien worlds by the European Southern Observatory (ESO). 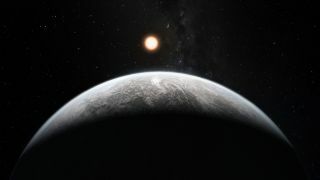 More than 50 new exoplanets — including one "super-Earth" that could potentially support life — were discovered using data from European observatory's High Accuracy Radial velocity Planet Searcher (HARPS) spectrograph, an instrument on the 11.8-foot (3.6-meter) telescope at the La Silla Observatory in Chile, ESO officials announced at the news briefing. This bounty of alien planets is the latest in a string of discoveries that effectively pushed the current exoplanet tally past the 600 mark. Given the technological advances in the field of exoplanet research, it's possible we could see 1,000 confirmed alien worlds very soon, said Wesley Traub, chief scientist of NASA's Exoplanet Exploration Program at the Jet Propulsion Laboratory in Pasadena, Calif.
NASA's planet-hunting Kepler space observatory has identified more than 1,200 planetary candidates, which are potential worlds that require more observation before they can either be confirmed as exoplanets or deemed false positives. Kepler uses the transit method to sniff out potential alien planets. This method looks for changes in a star's brightness caused by a planet crossing in front of it. ESO's HARP spectrograph, on the other hand, uses a technique called radial velocity that looks for repeated fluctuations in a star's movement potentially caused by a planet's gravitational pull. "As technologies get better, we are able to discover things that are smaller and have smaller signals, whether it's radial velocities or transits," Traub said. "People have always been looking for these small planets, but we're pushing really hard to make radial velocity work better so we can find something like Earth. That's basically the holy grail of radial velocity. The same thing is true about transits." And while the current tally of exoplanets stands at just over 600, there are some discrepancies in how people classify these alien worlds. According to the Extrasolar Planets Encyclopedia, a database compiled by astrobiologist Jean Schneider of the Paris-Meudon Observatory, there are now 645 detected alien planets. Yet, the Jet Propulsion Laboratory's PlanetQuest website, which keeps a count of confirmed alien planets, lists 564 planets (not including the ESO exoplanets announced today). This discrepancy is largely because the criteria for what constitutes an exoplanet can differ, based on the website or organization. "If you look at the European site (Extrasolar Planets Encyclopedia), it includes anything that has been announced," Traub said. "It's trying to be as complete a list as possible, so it will always have the maximum number of planets of the sites that list them. If something is announced, [Schneider] adds it on there. He's very, very attentive that way." NASA's PlanetQuest site, however, takes a much more conservative approach. PlanetQuest tends to not add an exoplanet to the list until it has been validated, checked, and the study has been accepted for publication, Traub said. "It's a very stringent set of requirements," Traub said. "The rule is, we don't want to have any mistakes, so we don't necessarily care if we're six months behind. We want to be sure of the number we're writing down." As for the amount of exoplanet findings that have been announced within the past two years, Traub explained that it's likely due to the serendipitous timing of the Kepler data's release, and other exoplanet-hunting missions. "It's largely because of the accidental confluence of when Kepler was launched and when we're getting the data," Traub said. "Same with radial velocity. People are getting better and better at it with time. It's kind of an accident, but it's a wonderful accident."